BAMBOO WHOLESALE is a family business. We are growers and suppliers of high quality bamboo plants for landscaping uses, especially bamboo privacy screens, but also for other practical uses such as craft work, construction and edible shoot production. 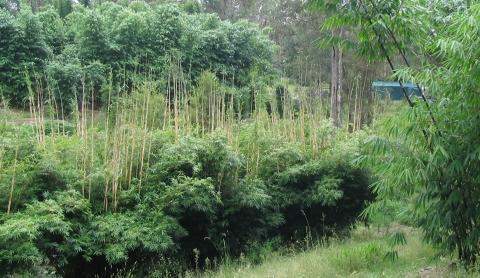 We live and grow our bamboo not far from Kempsey, New South Wales, in Australia. As Mid North Coast bamboo growers we enjoy an area considered to be at the boundary between the sub-tropical and temperate zones, and our climate here is mild with warm to hot summers and cool winters, with occasional cold and frosty, or cold windy weeks . Most of our rain falls in late summer and autumn, which coincides nicely with the water requirements of clumping bamboo. Many bamboo varieties grow well here and we are able to grow both running and clumping bamboos, though some species of both types are marginal here. Our aim is to supply bamboo plants that meet the highest standards of the ornamental plant market at best prices, bamboo poles from superior species, and propagation material for nurseries. The purpose of this web site is to inform you about bamboo, and what we can offer you. Our site was created by us - the notes, graphics, source editing and photos are all our own work. The cost of web hosting is the only maintenance expense. It is a home-made web site and we make no apologies for this. Advertising and marketing costs are ultimately paid for by you; the consumer. If anyone really wants to pay more to subsidise fancier marketing then please tell us when ordering. But, don't be surprised if we use the money for something useful instead. We have decided not to use the flash animations, sound recordings and other so-called "rich content" we created to use on this site. And, except for in this one exceptional and singularly extravagant sentence, we have arduously striven to avoid the florid and superfluous use of meaningless and euphemistic adjectival and adverbial descriptivism. The words "gorgeous", "shimmering", "cyber" and "majestic" appear nowhere else on this web site. And, despite some enthusiasm for the project, we have not yet included the one page that portrays all of these things in a tribute to the illusory and unimpressive world of hyper-marketing. Popular requests for other inclusions will be considered. And feedback (yes, even the kind that asks to be ignored), is welcome.